I tend to do this for all my trips, regardless of how long or short my stay will be. If you know the places you want to visit, the sights you want to see and the activities you want to engage in, you'll know exactly what you'll need to pack. Even researching the weather forecast prior to departure will help you be better prepared for whatever faces you out on your adventures. This is pretty much a life essential for me. If you read my post on staying organized you would know I pretty much make lists for everything (shopping, groceries, to-dos... you name it, I have a list for it) and traveling isn't the exception to that rule! Before I even touch my suitcase I'll map out a detailed laundry list of the things I need, i.e: 2 day outfits, 2 night outfits, loofah, face & body lotion...I think you guys get the point) Packing becomes so much less of a hassle when you can eliminate the reoccurring doubt of "Am I Forgetting Something?" from the start. Personally, by making lists I also avoid over-packing since I won't allow myself to pack the things I didn't write down. 3. Pack in advance and edit edit edit! You have your list in hand and suitcase ready for action, the next move is to get to it, ahead of time! I can't stress enough how crucial this is! If you leave packing for last minute you're only creating more stress for yourself. Also, by buying yourself some time you'll have a few days to take out those few bits and bobs you told yourself you just neeeeeded (looking at you 3 pairs of heels for a two day trip) and make some room for souvies to bring back! I like to pack at least a week in advance and leave the next few days to revise. 4. Don't touch your suitcase the day of! Since you've given yourself enough time you won't need to! You'll also avoid the risk of throwing in the "oh I just might need this for X occasion" items that you probably won't even touch all trip long. 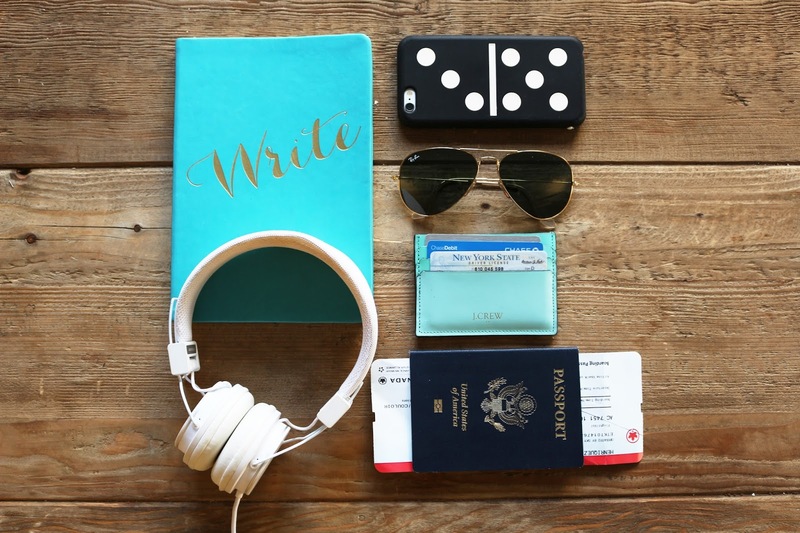 Lay out your traveling outfit, your hand item (backpack or handbag) and your suitcase(s) the night before, so that the day of all you have to do is wake up, throw on your clothes and go TRAVEL! I hope these tips come in handy the next time you venture out and also, that we all get to travel as often as we wish. Because, I just can't get tired of saying it, traveling is that gift that keeps on giving. So cheers to airplanes and adventures!